Description - The male of this species has flashing white sides, a green-black head, a white breast and a long, thin, red bill and feet. The female's body and sides are grey with a reddish-brown crested head and a white throat. The call is that of low, rasping croaks. Distribution - The breeding grounds range across Canada from eastern Alaska to Newfoundland on wooded rivers and ponds; they winter in the south as far as Mexico mainly on lakes and rivers and occasionally on salt water. Biology - The female lays 6-12 buff coloured eggs in a down-lined hollow on the ground or in a tree cavity. 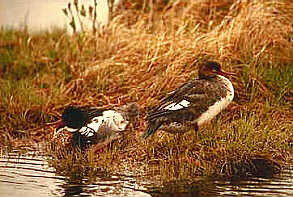 The merganser feeds on small aquatic life, insects and water plants, diving to pursue its aquatic prey. It's hooked upper mandible and saw-like teeth are designed to catch slippery fish. This small, chunky duck is nearly helpless on land.